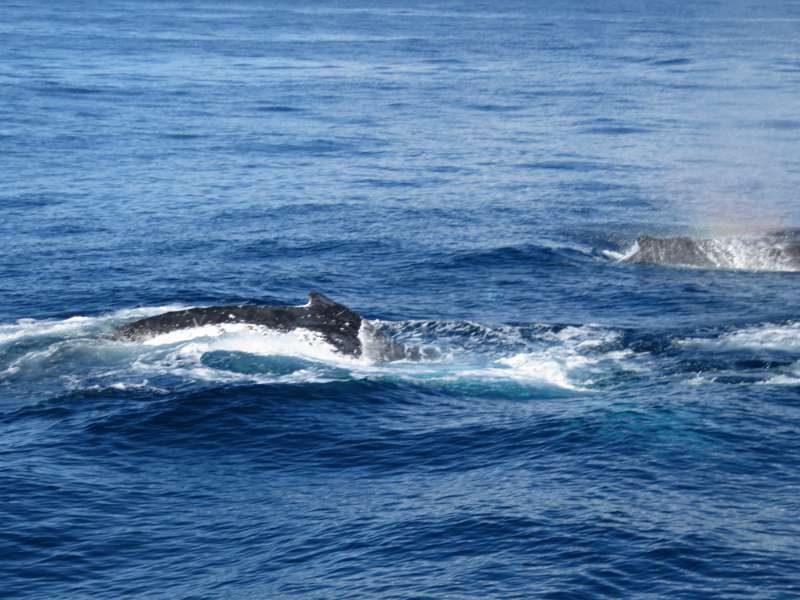 Every year from April to November humpback whales turn the east coast of Australia into a whale migration super highway. In the southern hemisphere's summer humpbacks gorge themselves on krill in the waters off Antarctica, then as winter approaches they head north on a 10,000 kilometre journey. The females give birth in the warm sub-tropical waters before returning to their feeding grounds in Antarctica. 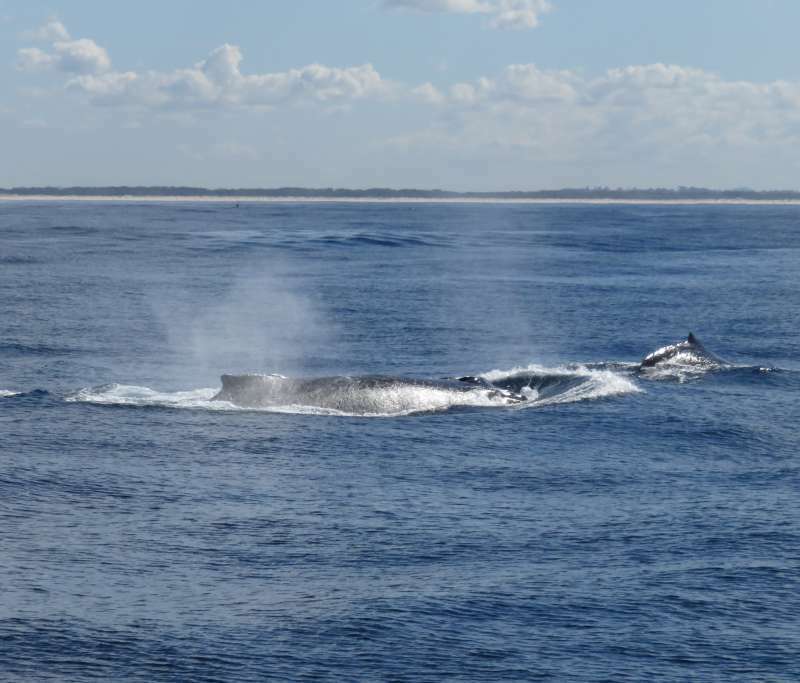 This makes Australia's east coast a world class venue for whale watching. Combine that with a near perfect winter climate and south-east Queensland must be one of the best places on the planet to see these magnificent creatures. David and I have just escaped the, only slightly less than perfect, winter weather in Sydney by spending a few days on the Gold Coast, in south-east Queensland, an hour south of Brisbane. 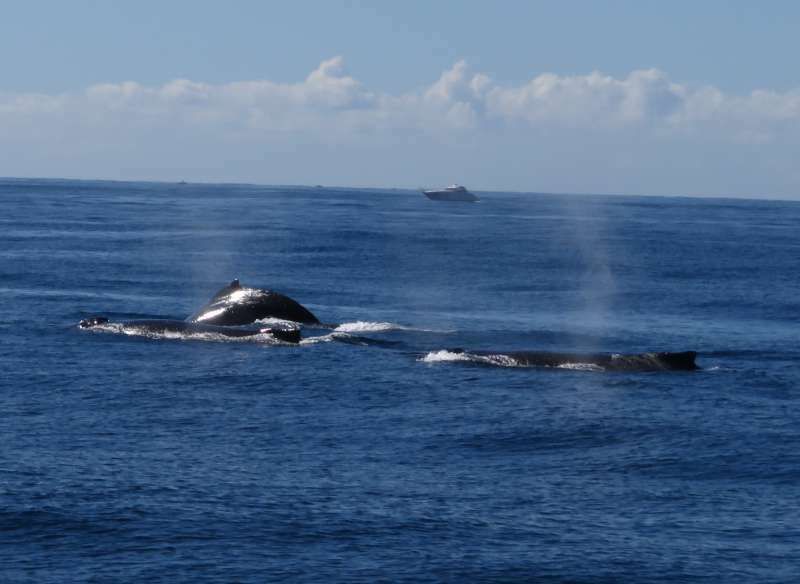 While we were there we couldn't resist the lure of the humpbacks. Whales in Paradise run whale watching tours out of the Gold Coast and when we got the chance to join a tour we didn't need to think twice. 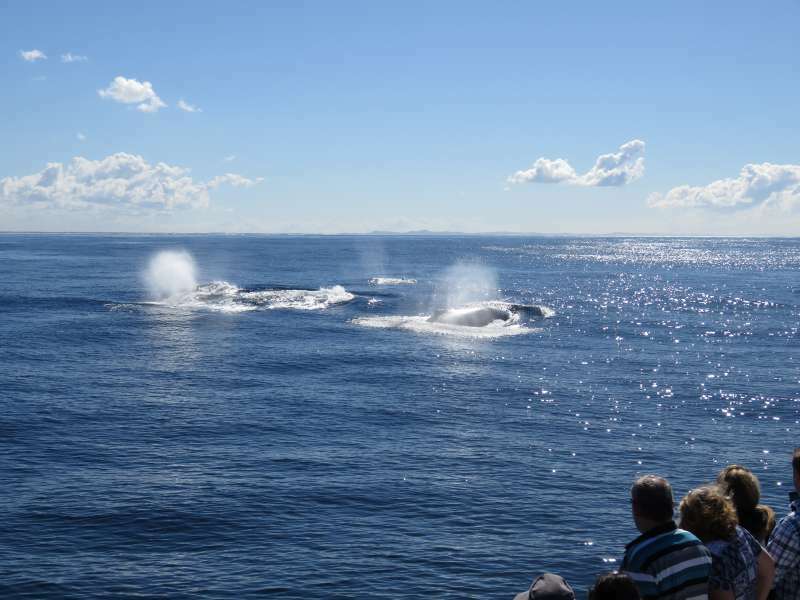 The best thing about whale watching, apart from the whales of course, is that you don't have to get up at an ungodly hour of the morning or go thrashing about in the bush in the middle of the night with a torch to see them. Unlike so many other animals you are just as likely to see whales in the middle of the day. Thus at the very civilised hour of 10 a.m. we negotiated the five-minute walk (you can see this was shaping up to be a really tough day!) from our hotel to the Whales in Paradise wharf in the heart of Surfers Paradise. Hard as it is to believe, we got lost! I have no sense of direction and David, whose navigational skills are usually faultless, was distracted by a phone call. Note to self: leave the mobile at home next time. Our hotel had about a hundred different exits (well at least three or four). We chose the wrong one and walked for the first few minutes in completely the wrong direction. Once we discovered our error it was all plain sailing but it meant we arrived at the wharf a little later than we had hoped. My first rule of tours is - arrive early. You don't want to get stuck at the back of the bus. I didn't need to worry. Whales in Paradise pride themselves on not over-booking so even those who arrived after us had a decent seat. Once the boat reached the whales everyone got up and moved around for the best view anyway. We got some great views of Surfers on our way out to sea. The Whale in Paradise cruise begins at a jetty in the Nerang River. 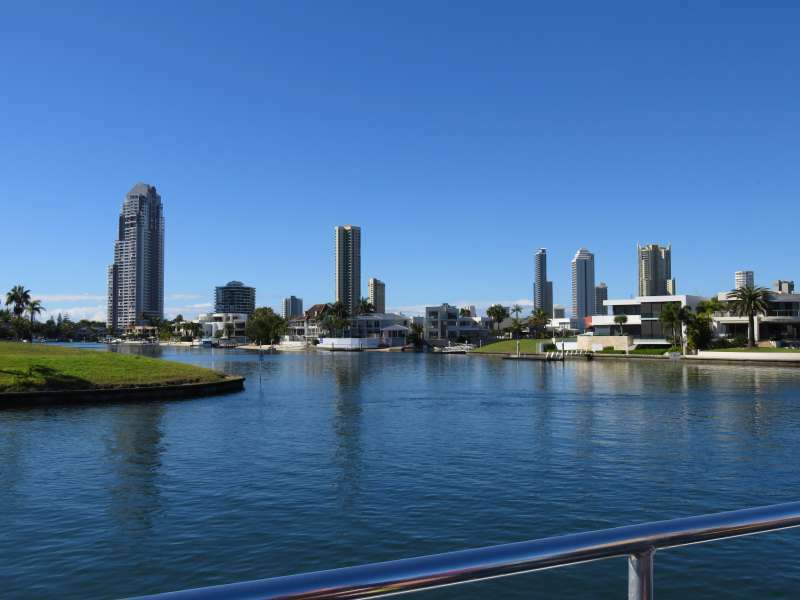 To reach the open waters of the Pacific Ocean we sailed past some of the most exclusive, and expensive, real estate on the Gold Coast. We were treated to perfect views of millionaire's mansion after millionaire's mansion with Wayne, our Captain, giving a running commentary on who owned what. The commentary sounded like a who's who of the rich and famous down under. I suspect David, who isn't much of an animal person, enjoyed the river cruise more than the whales! 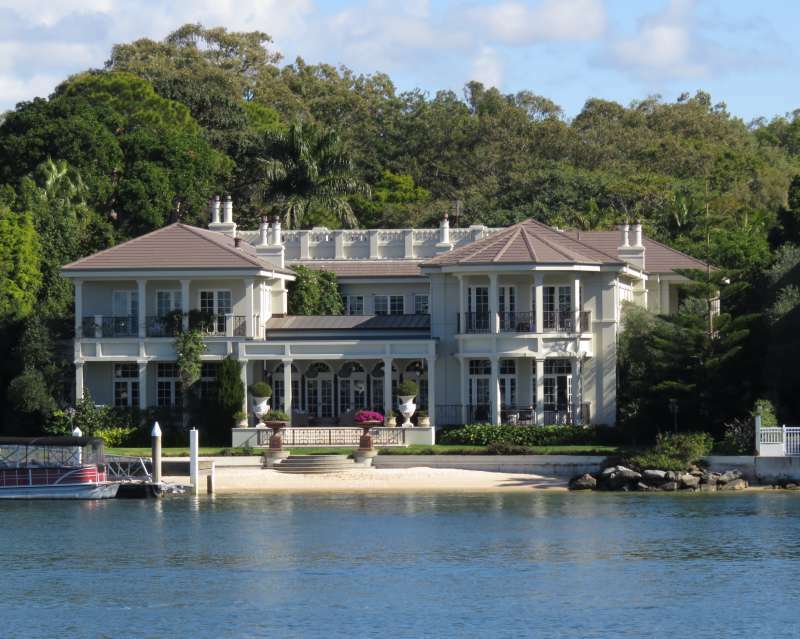 A Surfers Paradise mansion. Wayne told us the story behind this house but I can remember what it was. The holy grail of humpback whale watching is to see one of these magnificent behemoths launch its massive body out of the water in a full breach. Humpback whales are particularly fond of breaching but sadly for us our whales were not in a playful mood. There was no shortage of them. The Captain estimated there might be as many as 100 in the vicinity and we saw at least a dozen or so but they had other things on their minds. They seemed to be whales on a mission, full steam ahead, with none of the playfulness or interest in our boat which humpbacks are famous for. According to Laura, the whale expert on board, most of the whales we saw were mature males competing for the attention of a female. I think the female was playing hard to get, or maybe she was just waiting while they wore each other out in that age old testosterone filled rivalry which males all over the planet (yes, guys I am talking about you) indulge in. For mile after mile they brawled and bumped each other in their quest for dominance. A mature humpback can weigh 40 tons. The sight of a hundred tons or more of animal flesh battling it out at high speed all the while chasing their hoped for female conquest was breathtaking. To borrow a description I read on the Internet - it gave new meaning to the phrase 'the running of the bulls'. Finally, like some of the weaker animals, we gave up the chase. The defeated whales went off to recover and lick their wounds. We turned toward another pod on the horizon - the contest continued until we were out of sight. 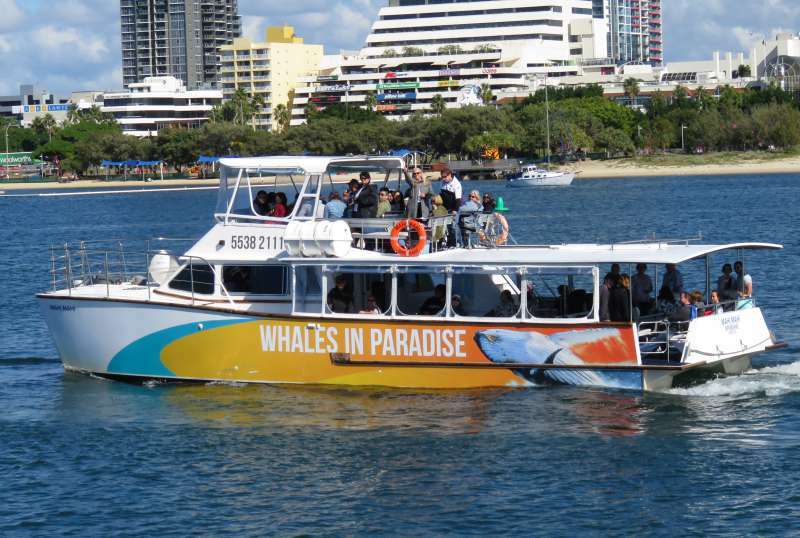 Whales in Paradise tours leave the Gold Coast at 7.00 am, 8.30 a.m., 10.30 am, 12.30 pm, and 2.30 pm. There is a 9 am pick-up from Brisbane which meets the 10.30 am tour. The tour takes about 3¼ hours. At the time of writing the tour (ex-Gold Coast) costs $99 for adults, $69 for children (0-14yrs) and $267 for a family pass for 2 adults and 2 children. Click - here - for up to date information. How to book a Whales in Paradise tour? Click - here - to book a tour online. Or contact Whales in Paradise by phone on (07) 55382111 or for international calls (+61) 7 55382111. When is the whale watching season in the Gold Coast? The annual migration of humpbacks along the east coast of Australia takes place between April and November. The main season on the Gold Coast runs from 1 June to 31 October. Will you definitely see whales? Whales in Paradise advertises that it has a 100% daily sighting record. 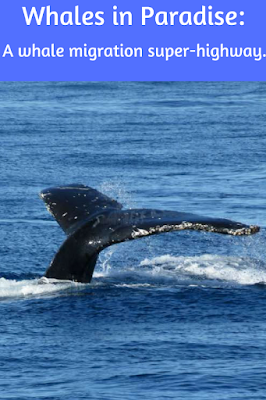 If you take a cruise between 1 June and 31 October and a whale is not sighted then you will receive either a refund or a free return cruise. Click - here - for details. What if you suffer from sea-sickness? Whales in Paradise cruises go into open water. Even on a calm day you can get quite a swell - we did. I can get sea-sick in the bath so if I can do it so can you. Find a good sea-sickness medication and take it before you leave the wharf. Don't panic if you forget. Whales in Paradise have medication on board for a small price. Carry some water or better still, ginger beer, and take regular small sips. Sit on the top deck in the open air facing forward with the breeze in your face. Wear sensible shoes - this is not a place for heels. Don't worry too much about where you are sitting on the boat. Once we reached the whales everyone got up and stood by the railings. This photo gives you an idea of how far away from the boat the whales were for most of the time. Once or twice they came a bit closer but because they had other things on their minds they didn't show the curiosity in the boat which I have sometimes seen on whale watching cruises. On board. As you can see, there was enough room for everyone to move around. Note: David and I were guests of Whales in Paradise. I hope you get a chance to do it one day and that you see lots of whales. It is breathtaking when you see them up close. It looks like you had a fabulous day watching the whales. I've been out multiple times and you captured some classic images. 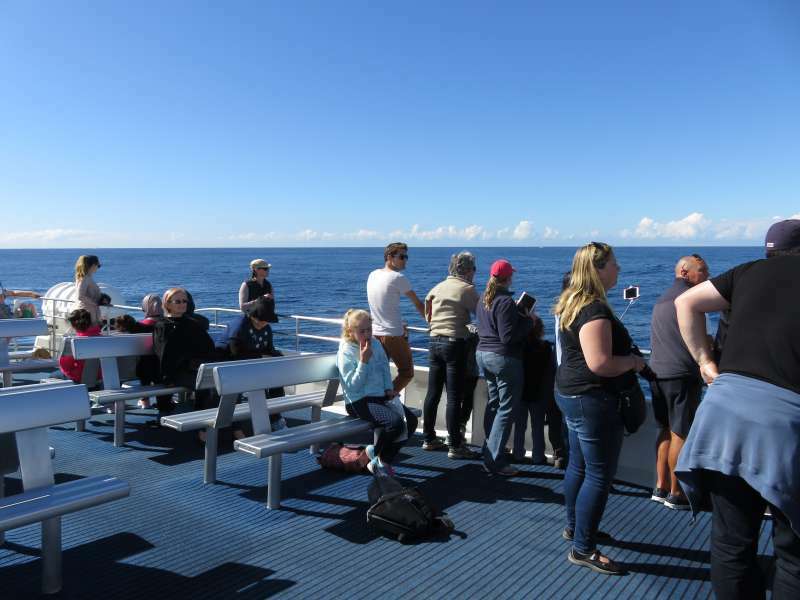 The prices for Whales in Paradise are very reasonable compared to the other whale watching tours I have been on. 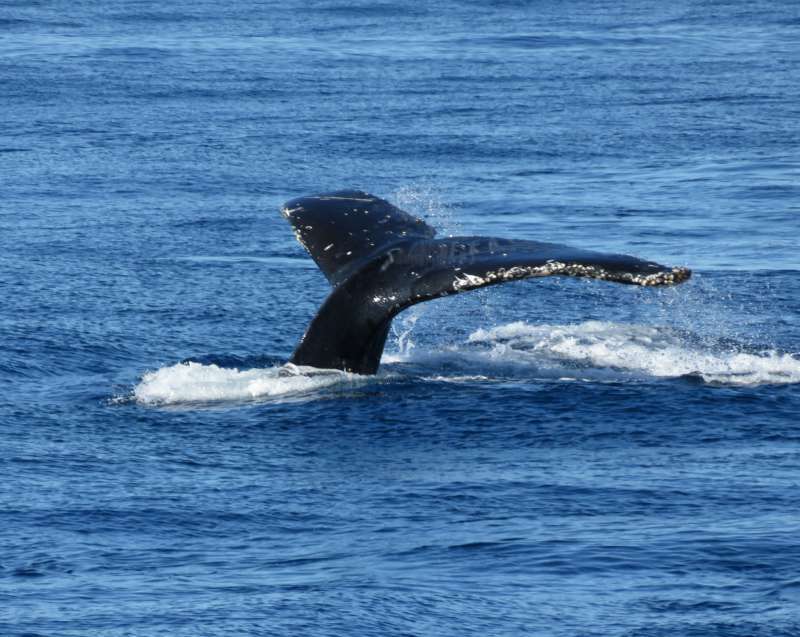 Prices for whale watching tours vary a lot but then some places require more time to get out to where the whales are. Now that our boys have grown up and David and I only have to pay for two tickets to things rather than four, I think everything is reasonably priced - lol. Whale watching is definitely on my list of things to do Lyn. We considered it in Costa Rica but never got around to it. Marked down though, especially with the awesome images you shared here. Seems like a fun morning or afternoon activity depending on when the whales swim on through. The whales swim through all day. That is one of the great things about whale watching. You can pretty much go when you want as long as it is in the season. The big thing is to check when the best months to see them are. 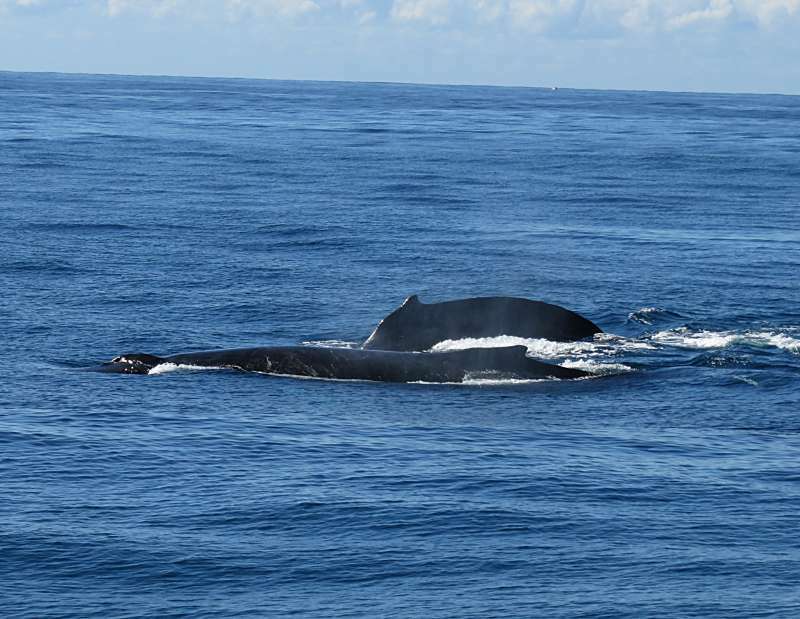 I tried whale watching in New Zealand and Sri Lanka, and I have to say I was a bit disappointed. We saw one in New Zealand, it didn't breach and the tour in Sri Lanka yielded nothing... I prefer swimming with dolphins... Maybe I'll give whale watching another go sometime. Thank you for sharing. I am fairly sure you live in Sydney. The whale watching here is a lot better than you would think. I went out a few years ago and we saw whales up close to the boat. The trick is to go when the numbers are greatest. I love whale watching! Looks like you had a great time and your pictures turned out amazing. Thanks for sharing on #TheWeeklyPostcard. We have a great day. The perfect weather helped a lot. It would have been fun even without the whales. 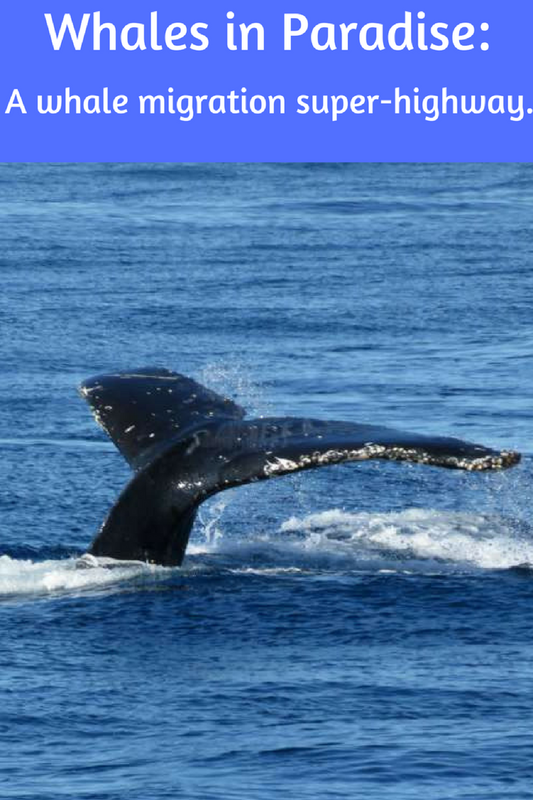 We are headed to South Africa in October and whale watching at Hermanus Bay is on my list. Whale watching has always been hit or miss for me - I've never seen what you saw on your trip. It looks fantastic - and I would go in a heartbeat. I know what you mean. I once went on a whale watching trip at Port Stephens in New South Wales and we didn't see a thing. I have a pretty good hit rate though with good sightings on most of the trips I have been on. The trick is to find out which month has the most whales and go then. If possible try to pick a calm day too because you see better without too much swell. Do you get whales in California? I don't ever remember seeing whale watching cruises there. I get seasick, so I'm glad to know it's manageable with meds. I've only once seen a whale while we were on a ferry, and it was quite far away. I'd really enjoy a whale watching cruise. I'm amazed at how many there are in your photos. No one on the planet gets more seasick than I do! The other thing that works but I have no idea why so I don't really trust them are sea-bands. They are supposed to work by acupressure and when I was pregnant and breastfeeding they saved me a couple of times. We fly to Western Australia tomorrow where swimming with whale sharks is one of the things you can do. David is not comfortable in the water so sdaly, i don't think I'll get a chance to do it. The most amazing experience I have ever had watching whales was in Albany, Western Australia. There were whales in the bay and it was just amazing. I remember standing on a headland looking down on their magnificent backs as they passed directly beneath me. The second best whale watching I have done was in Maui. If I ever go back there whale watching is at the top of my list of things to do again. Ahh I'm so jealous! I still haven't seen them in the wild. You got some great photos of them! There are so many great whale watching spots around the world. I am sure you will see them in the wild one day. I once saw a whale breach. It was in Sydney, where I live, which just goes to show that sometimes the best things are right in front of you. Looks fantastic. Wish we had been there in whale season. I suspect our April trip was still a bit early, as nobody mentioned whale watching when we were there. You will just have to come back. We met up with you in February so there were definitely no whale watching tours then. Also I seem to remember that while you went to Far North Queensland you didn't get down as far as the Gold Coast, which is quite close to the New South Wales border. I am fairly sure they do whale watching in Cairns but April would be a bit too early. I am no expert but it makes sense that the further north you go the later the season starts. They are the same whales - you're just looking at them at different stages of their journey. I@m moving to Australia later this year so I will most definitely be checking out this company! WOW. I am not sure where you are moving too. Australia is a big country but if you ever find your self near Brisbane or the Gold Coast I can recommend Whales in Paradise. I adore humpback whales and have been fortunate to take in some great whale watching around the world. But I still haven't been privilege to a full breach. Have seen a partial breach, but never when the whale lifts its entire body out of the water. I once saw a full breach off Sydney. It was fabulous - but quick. Too quick to get a photo unfortunately. This is something we'd love to do! Whales are so intriguing, and seeing them seems like winning the wildlife lottery! Great details - we're taking notes for later. Thanks for sharing on #TheWeeklyPostcard and #WeekendWanderlust! There are lots of places around the world now where you can get a stunning view of whales. Fortunately for me the southern hemisphere seems to have more than its fair share. I have been fortunate to go on whale watching boats and see these magnificent mammals. You certainly captured the experience with your words and your lovely photos! On Thursday we saw whales from the air. There were so many I couldn't count them all. I wish I was a better photographer so I could photograph them that way.